I recently did that Facebook thing where you post the cover of ten albums that had a huge influence on you. Joni Mitchell’s Blue is one of those albums for me. The title song, along with several others, stand alone as memorable tracks. But to my ear, Blue is an album much more than it’s a song – the songs are so bonded together that they are more like movements of a symphony than individual songs. Blue was a life-changer for me: it changed the way I wrote, the way I played, and in some ways was the doorway to thinking about the whole of life in a different key. Joni is right – songs are like tattoos. They get under your skin and become part of you, and once they are there they are almost impossible to erase. One of the things that makes the album so haunting and poignant is that in every single song, Mitchell tells us she is in one place, wishing she was somewhere else. She’s in Paris wishing she was in California, in Spain wishing she was in Paris, in Canada wishing she was anywhere else but here, in a plane wishing she was on the ground, in a cafe wishing she was in a house, in a bar wishing she was in Europe… It’s this dislocated, alienated quality that gives the whole album a feeling of disruption and longing – the nervy edge that lies underneath the moments of wild joy in Carey, or deep introspection in Little Green. What a wonderful album. My old vinyl copy I keep for sentimental reasons. The cassette I used to play in my van on tour a long time back has gone to the record store in the sky. Now, of course, even my CD version is beginning to look a tad dated, and it’s the iTunes version that goes with me. And I daresay I shall own it in another format or two more over the coming decades. Along with Bach’s double, the Beatles’ Revolver, Morricone’s The Mission, and Paul Simon’s Graceland, Blue is one of those lifetime accompaniments. It’s the feast of St Thomas today–July 3rd being the date Jerome chose to celebrate him. Doubting Thomas is the uncomplimentary title that Thomas has often been tagged with, and his story is often told as a rebuke to those who doubt, or perhaps more kindly, an encouragement to have more faith. But it would be more accurate, I think, to call him Honest Thomas. He was a man of integrity; he was the disciple that asked the awkward questions everyone else was thinking but didn’t say out loud. “We do not know where you are going, Lord, how can we know the way?” asked Thomas, at the Last Supper. And by the same token he didn’t pretend to believe things that he didn’t really; he didn’t say the words everyone else was saying just to feel part of the crowd. It’s hard to own up to being the odd one out among a group of friends, and it was brave of him, when he found he was the only one not to be convinced of the resurrection, not to go off and be by himself. For a whole week he went on meeting up with the other disciples. Their faith, their joy, their stories of visions of the resurrected Christ, must have made him feel uncomfortable and left out. But he still hung around. Eventually, Jesus came and met him in person. His integrity paid off; when faith came to him as a gift, it was his own and not someone else’s. Doubt is not the same as unbelief. Unbelief is a determined refusal to believe, whereas doubt is an honest owning up to not being convinced, and finding that the people and the ideas we encounter in this life can knock holes in our faith. To admit to doubt is to stay alive; there is nothing more wooden than a so-called “faith” that is really a repetition of ideas through obedience, coercion, or the desire to fit in, rather than conviction. If you are looking for certainty, then I guess you want to eliminate doubt. But faith is not certainty: it’s the pursuit of truth that must inevitably include episodes of doubt. And those episodes are, in the end, what open us up to fresh revelation. So Thomas’s doubt is not a rebuke, I think, but an encouragement to us to recognize that faith is the uncomfortable space between asking the awkward questions, and waiting on the answers. Mothers’ Day in the USA has different historical roots from our “mothering Sunday”, although both have regrettably been turned into yet another greetings card and chocolate extravaganza, with no substance to them at all, just a means of inflicting guilty over-spending on a consumerist society. “Arise, then, women of this day! Arise all women who have hearts, whether your baptism be that of water or of fears! Say firmly: “We will not have great questions decided by irrelevant agencies, Our husbands shall not come to us reeking with carnage, for caresses and applause. Our sons shall not be taken from us to unlearn all that we have been able to teach them of charity, mercy, and patience. We women of one country will be too tender of those of another country to allow our sons to be trained to injure theirs.”From the bosom of the devasted earth a voice goes up with our own. It says, “Disarm, Disarm!” The sword of murder is not the balance of justice! Blood does not wipe out dishonor nor violence indicate possession. Robert Farrar Capon, The Astonished Heart (p. 120). Karl Barth, Rudolf Bultmann and Paul Tillich are taking a break together, fishing on Lake Geneva. They are having a lovely time, smoking their pipes, chatting idly. It’s hot, and soon they get thirsty. So Karl Barth gets up, steps out of the boat, and walks across the water to the shore, gets some beers and returns. It’s quite hot so the beer doesn’t last long. Barth tells Tillich: “your turn, Paul”. Tillich gets up, steps outside the boat, walks across the water, and fetches some beer. It is getting really hot now, and the beer is finished once again. Bultmann is beginning to sweat particularly profusely… and finally Barth asks him too: “Come on, Rudolf, your turn now.” With a slight tremor in his knees, Bultmann gets up, steps out of the boat, and sinks like a stone. Fortunately he is a good swimmer; he drags himself back into the boat and sulks at the far end. don’t even know what the God-word means to me now. I do know love when I meet it though. Oh yes, I recognise Love. Lent is not far away now: it begins on Wednesday. One of the most common practices is to read a book through Lent, a few pages a day. For regular readers who always read on their commuter train or before they go to sleep, it might give you a chance to read more slowly and contemplatively. And for those who can get through an entire year and wonder at how they haven’t got round to reading a whole book, it breaks a book in to bite-sized pieces and helps you recover a lost habit. 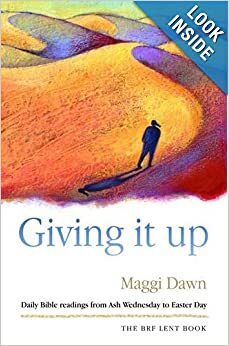 Of my own books, Giving it Up is written specially for Lent, with a bible passage and two or three pages of reflections set for every day. Accidental Pilgrim (Kindle Edition here) is a memoir in which, weaving together history and literary nuggets with my own experiences, I explore the idea of pilgrimage: what is the difference between a tourist and a pilgrim, can you be a pilgrim in everyday life or a literary pilgrim, and how can you have a pilgrim soul if you aren’t able to make a lengthy journey away from home?